Ashburton Grove - Arsenal news and Arsenal opinion: PHW slams booing Gooners -Missed out on Mata? -Nasri off for £22m? PHW slams booing Gooners -Missed out on Mata? -Nasri off for £22m? I had an "oh dear" feeling when I saw that the chairman Peter Hill-Wood had spoken to his media outlet of choice - the Daily Star - about our current predicament and I was right, it doesn't endear the chairman to the rest of the Arsenal fan base. At a time when it would have been better in my view to keep quiet and wait for our transfer business to be worked on in the next nine days, the chairman has placed his rather hefty size tens on some rather dodgy ground. "I think it is unattractive but I suppose they pay their money and are entitled to do what they want. I think it is unjustified." "As Arsene said, we are looking to buy some players but we are not going to do our business in public. They are going to have to be bloody patient – as we are. 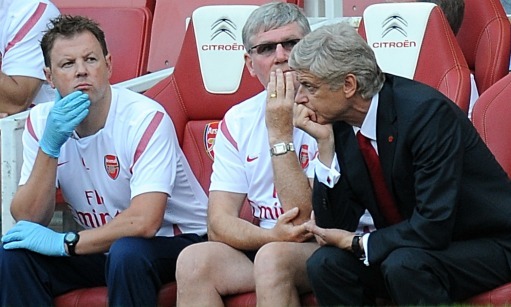 "It is frustrating for both the fans and Arsene and the board. "I don’t listen to the pundits, quite frankly. I am 100 per cent behind Arsene and so are the board. I think he has done fantastically well." Whilst totally against booing - and I did not take part myself - I can completely understand the frustrations of those fans who did. As I said in the blog yesterday, the time to question the ambition of the club is not after a pre-season game but when made our purchases in the transfer market. The manager and chief executive Ivan Gazidis have promised they will be busy in the window and the club do have the funds to buy players. I cannot see how they can't justify spending that money when it is clear we've yet to deal with our weaknesses from last season. Saying we were priced out of a deal isn't good enough. We are targeting two players (Mata and Jagielka) who are at clubs who don't have the money to do their own business until they sell players. Obviously they want the right price for them but they are willing to do business with us, if we make them a sensible offer. I'm disappointed in the chairman's them and us attitude. Without the fans he wouldn't be able to enjoy the £60k salary and luxury matchday hospitality he receives as Arsenal chairman. We are all in this together and he should realise this better than most. And I'm glad he's also frustrated we've been unable to conclude our transfer business, because it is painful for all those who watch Arsenal to see a great man like Arsene Wenger seemingly regressing as a manager because he has become stubborn and set in his ways. "Some people have gone 25 years without a trophy and it is becoming more and more difficult with all the people with unlimited pockets." I'm sorry but that attitude is not good enough. We are the Arsenal and we should be winning trophies and that should be the aim of our club. We don't have the budget of Manchester City, Chelsea or Manchester United but that doesn't mean we should not have ambition to win a trophy. Six years is a long enough wait and it's not like we've not had our chances. If we are to have any chance of winning something this season, we have to invest in our squad. And it seems that one of our main targets, Juan Mata, will cost that bit more because the deadline on the clause in his contract to leave for another European club for a set price has now passed, according to The Guardian among others. It seems as though a lot depends on whether Barcelona finally come up with the money for Cesc Fabregas and whether Samir Nasri leaves. The Frenchman is subject to a £22m bid from Manchester City which will be sent to Arsenal in the coming days according to The Sun. Whilst I understand we need to balance our books to ensure we don't live outside our means, we do have cash to spend. We need a goalkeeper and central defender so why not go and sign those players now? We also need to move on those players who have no future at the club, i.e. Manuel Almunia. We cannot go into the season with him still in the first team squad. And with Nicklas Bendtner being touted around Europe - the latest club to be linked with his services are Stoke according to the Daily Mail - we need to finally decide if we're going to get the right price for him or not because I still believe he is a useful player to have in the squad and should not be sold. There is transfer related speculation concerning the future of Joey Barton now he's been offered as a free transfer by Newcastle. I'm sure that Arsene will look at him now he's available for nothing. For extra reading today, head to The Guardian for Kevin McCarra's take on the current situation at the Grove. And finally, have your fingers crossed for the rest of the day hopefully awaiting good news on the results of the scan Jack Wilshere will have on his ankle. Let's hope he's available for Newcastle on August 13.